17 Jan 2008, Summit 3! 15 Jan 2008, Summit 2! 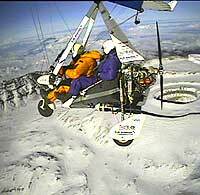 OBECTIVE: To fly a Microlight over the highest mountain on every continent, and YOU could be involved as co-pilot. The Seven Summits are the highest mountains of each of the seven continents; Africa, Antarctica, Asia, Europe, North America, South America and Oceania / Australia. Summiting all of them is regarded as a mountaineering challenge and less than 250 people have done it since the idea arose in the mid 1980's. This challenge is to be the first to fly over all seven summits in a microlight, but there is an opportunity for you to be involved in these historic World's firsts as the co-pilot. Richard Meredith-Hardy has been flying microlights for 25 years and is one of the most experienced 'expedition' microlight pilots in the World. Amongst other notable flights, he was the first person to fly a microlight from London to Capetown in 1985/6 and in March-April 2007 flew with blind co-pilot Miles Hilton-Barber from Rhodes in Greece to Sydney, Australia . He has been World and European microlight champion and has been awarded the Royal Aero Club gold medal and the FAI Gold Air Medal. 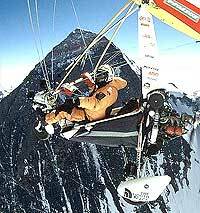 In 2004 he flew over Mt Everest as part of an expedition to tow the Italian pilot Angelo d'Arrigo in a hang glider to the summit. The following year they went together to do the same over Mt Aconcagua in Argentina, the highest mountain outside the Himalayas. By this time the idea of doing the same together over all seven summits was beginning to look possible, but before any further expeditions could be made, in March 1986 Angelo was tragically killed whilst riding as a passenger in a light aircraft. Together they had made a good team: While Angelo was particularly talented at raising the funding for these expeditions, and had become very famous in Italy as a result, Richard developed, built and tested all the specialist technical equipment necessary for such extreme flights, notably the the unique high-altitude microlight he used to tow Angelo and the various life-support and communication systems they both used. The unique high-altitude microlight which Richard had used to tow Angelo to both summits was renamed to "Espirito d'Angelo" in memory of his former partner, but with no hang-glider to tow, Richard changed the format to one of flying over more of the 7 summits with a co-pilot who has the skill to raise funds for the expedition. In January 2008 Richard went with David Barker to Tanzania to fly over Kilimanjaro. The expedition achieved all its objectives, four tandem flights were made over the summit and additionally the team returned with three UK records and two World records, one more than anticipated. For the first time, some really good quality video footage was collected from on-board cameras. A partner has been found for a flight over McKinley, hopefully in September 2009. If all goes to plan this will complete the four highest peaks of the seven summits and it is hoped that at least one of the existing World Records can be improved upon. As for Elbrus, Vinson and Carstenz Pyramid, if you are interested to participate in a genuine World-first which optionally has excellent media possibilities, and you are good at raising funds, then please do not hesitate to contact Richard Meredith-Hardy to discuss the possibilities of flying together in a microlight for the first time over one of the World's highest peaks. Statistically, flying in microlights is rather safe. Of course these flights are in potentially quite extreme conditions, but it is always the weather which is key, and usually it's just a question of waiting until it is suitable for an attempt. Pretty much all the necessary equipment has already been tried and tested on the expeditions already completed. As part of your preparation you will certainly have to visit a hypobaric chamber so you'll understand the sort of things that can go wrong at high altitude and be able to react accordingly. Otherwise you have to be pretty fit, and, depending on the expedition and budget, be prepared to camp out, sometimes in fairly hostile conditions, but we do try to make things as comfortable as possible. Succeeded 24 May 2004. The highest mountain in the World. Despite some very marginal weather conditions and some last minute technical glitches, towed Angelo d'Arrigo in his hang glider to a point very close to the summit and shortly afterwards Richard exchanged waves with a group of climbers who were standing on the summit as he flew over them. Technically, this was an extremely difficult expedition. The takeoff from Syangboche at 12200 ft was very marginal while towing a glider, the weather was extremely variable, logistics were difficult and of course Everest is a very dangerous place, but two years of detailed preparation meant that the things which did go wrong were never a show-stopper, and when a suitable weather window did eventually occur the team was able to fully exploit it. Succeeded 31 December 2005. The Stone Sentinel, it is the highest peak in South America and the World's highest mountain outside the Himalayas. 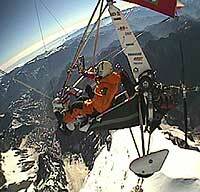 Richard towed Angelo d'Arrigo in his hang glider over it. As with Everest, the weather on Aconcagua can be very extreme and it is necessary to wait until it is suitable for an attempt. There is no airfield within reasonable range so takeoff was made from the main road between Chile and Argentina. A good road meant that logistics were not anything like as difficult as with Everest, but none the less, it was quite a remote place and needed good preparation. To be done. Possibly in September 2009. 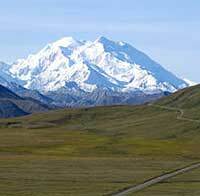 Alternatively known as Denali or 'The Great One', it is the highest mountain in North America. McKinley has a larger bulk and rise than Mount Everest and is characterized by extremely cold weather; a thermometer left exposed at an elevation of 15000 feet (4600 m) recorded a temperature of -73.3°C at some point during its exposure. Due to its high latitude there is also a higher risk of altitude illness for climbers than its altitude would otherwise suggest. Despite this, it is considered to be of medium difficulty to fly over in a microlight. The oxygen equipment we've been using has been proven to much greater elevations and the clothing to much colder temperatures than anticipated in late summer in Alaska. Logistically, the mountain is located quite close to the main highway between Fairbanks and Anchorage and there are a number of airfields within 30 - 50 miles of the summit. Succeeded 13 January 2008. The roof of Africa. Kilimanjaro is the tallest free-standing mountain in the world, rising 4,600 m (15100 ft) from its base, and is the highest peak in Africa. Flying from Moshi with co-pilot David Barker, the flight took just over one hour. In all, four tandem flights were made over the mountain, on one flight three UK records and two World Records were broken. Technically this was relatively easy mainly because the expedition was based at an airport, the weather is rather simple to predict and there are no other big mountains nearby to create unexpected turbulence. To be done. Elbrus is located in the western Caucasus mountain range near the border of Georgia. 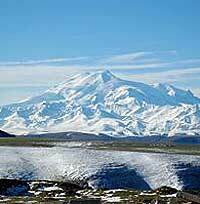 A stratovolcano that has lain dormant for about 2,000 years, the west summit is the highest mountain in Europe. Technically and logistically this should not be too difficult to fly over, there are several airports within a reasonable distance to the North, but it is in a very sensitive area politically and it may be quite a task to obtain the correct permissions. Mt Vinson, Ellsworth Mountains, Antarctica. To be done. 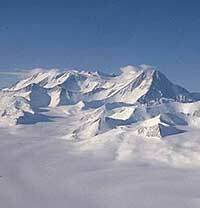 Vinson Massif is the highest mountain in Antarctica, located about 1200 km from the South Pole. Only discovered in January 1958 it was the last of the seven summits to be climbed, on 17 December 1966. Although not a very high mountain, logistically it will be a big and expensive job to get our equipment there. Probably the best option is to fly into Patriot Hills, fly the 215 Km to Vinson Base Camp, and launch the final assault from there. This is the sort of expedition which will require extensive planning over an 18 month period which would include a week or two somewhere cold like northern Sweden to test all the equipment. The first Seven Summits list was established in 1985 by Richard Bass and is known as the Kosciusko list which has the highest mountain of mainland Australia as its seventh summit. Reinhold Messner, the first man to climb Everest without supplimentary oxygen, created another list known as the Carstensz list which takes on the concept of Oceania as the seventh continent and in this case New Guinea's Carstensz Pyramid is the highest summit. From a mountaineering point of view both lists are accepted equally, but Messner's list is the more challenging one. 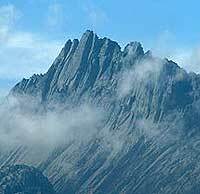 Climbing Carstensz Pyramid has the character of an expedition, whereas the ascent of Kosciuszko is an easy hike. In terms of the challenge of flying a microlight over all seven summits, both lists are equally valid, but if the Carstensz Pyramid is included, then every flight will also be the first flight by microlight over each of the seven summits. Carstenz Pyramid (Puncak Jaya), Papua province, Indonesia. To be done. Carstenz Pyramid in the Maoke Mountains is the highest mountain in Indonesia, the highest on the island of New Guinea, and the highest in Oceania. 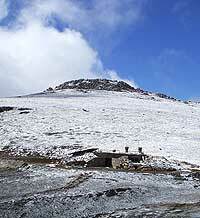 It is also the highest point between the Himalayas and the Andes and the highest island peak in the world. It was first climbed in 1962. In an area of extremely high rainfall, weather is likely to be an issue. Logistically it is rather remote, although the Grasberg mine, the World's largest for gold and third largest for copper is close by, but this also makes it a rather politically sensitive area. The nearest airfield is about 60 Km away. To be done. The ridiculous thing is that Richard was within a day's flying of Kosciuszko when the flight from London - Sydney finished on 30 April 2007, but the thought to carry on and fly over the highest mountain in Australia never occurred to him. Never mind, Australia is such a brilliant place to fly, another visit would be no trouble at all! Kosciuszko was named by the Polish explorer Count Paul Edmund Strzelecki in 1840 in honour of the Polish national hero General Tadeusz Kosciuszko, because of its perceived resemblance to the Kosciuszko Mound in Krakow. Flying over it is not considered a very difficult feat and no special equipment will be required. The alternative 7th summit is Carstenz Pyramid, Indonesia. The following organizations have helped one or more of the expeditions.